Summer is on our doorsteps and it´s getting warm everyday. Though the weather is not what we used to have in the last few years but at least the sun shines every now and then. For me, this is the coldest month May that I have experienced. Last week I felt that Autumn came back. Alas, the warm weather is coming back again. Welcome to summer months in Germany. Summer months in Germany means a lot to me. Time for me to harvest strawberries in the farms open to the public. That means I can harvest the strawberries in this farm and eat the strawberries while harvesting. What I have eaten are not included in the basket of strawberries I have to pay. I only have to pay the kilos of strawberries I have in my bowl or basket. Do you have this summer kind of business in your country? What am I going to do with all the strawberries I am harvesting? Well, a lot. I make smoothies, milkshakes, ice candies, cakes, marmalade, jam and of course I freeze them for my winter consumptions. 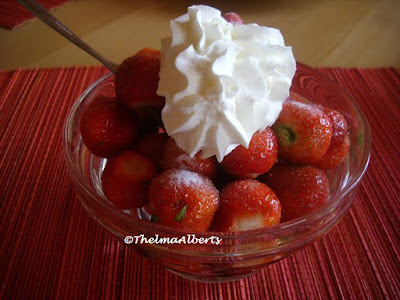 Strawberries in winter are very expensive and so it´s very handy to freeze some. Do you know how to freeze strawberries? Well, I have written about this a very long time ago and I hope this article will inspire you to save and freeze strawberries. Here are the links about strawberries. What about making tartlets of strawberries for your afternoon coffee or tea! What about drinking a refreshing strawberry smoothie! These are some of the ways to enjoy the healthy summer strawberry fruits. You have to try them for the sake of your health. Thanks for your visit. Have a great day! 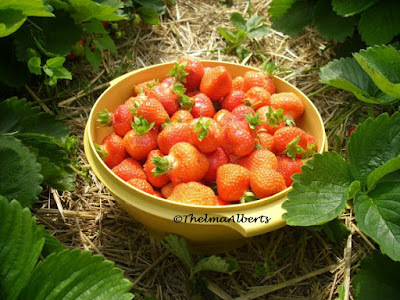 I do love strawberries Thelma, yes we do have farms where you can pick your own and pay for what you pick. Beautiful pictures Thanks! That is great Eugene Monaco. I am glad you have that there, too. Thanks for your nice comment. Have a lovely week. I love strawberries. I have been freezing them for years. That´s great Sandy KS. We will still be having strawberries even if no longer in season. Thanks for dropping by.